Virginia is a state in the United States. Its capital is Richmond and its largest city is Virginia Beach. The official name of Virginia is the Commonwealth of Virginia. Virginia is bordered (touching) by West Virginia, Maryland, and the District of Columbia (across the Potomac River) to the north, by Chesapeake Bay and the Atlantic Ocean to the east, by North Carolina and Tennessee to the south, and by Kentucky and West Virginia to the west. 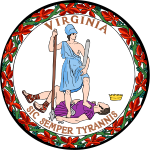 Virginia became a state in 1788 after the American Revolution. Before it became a state of the United States, Virginia was one of the Thirteen Colonies of Great Britain. Virginia was founded (started) in 1607 in Jamestown, Virginia. The state of West Virginia was part of Virginia until the American Civil War. Virginia then left (seceded from) the United States and joined the Confederate States of America. The western counties of Virginia seceded from Virginia to form a new state which was loyal to the Union. After the end of the Civil War, Virginia became part of the United States again in 1870, but the counties that had left to start West Virginia did not join Virginia again. Virginia is the state where eight United States presidents were born. This is more than any other state. 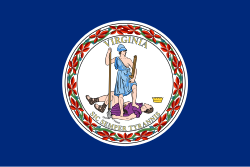 Wikimedia Commons has media related to Virginia. ↑ "Factpack" (PDF). Virginia General Assembly. January 11, 2007. Archived from the original (PDF) on October 28, 2008. Retrieved October 14, 2008. ↑ "Virginia: Population estimates". U.S. Census Bureau. July 1, 2017. Retrieved May 6, 2017. ↑ 4.0 4.1 "Elevations and Distances in the United States". United States Geological Survey. 2001. Archived from the original on November 2, 2011. Retrieved October 24, 2011. ↑ 6.0 6.1 "Articles, facts & infographics about Virginia Agriculture". Farm Flavor. Retrieved 2019-03-29. ↑ "Key Industries | Virginia Economic Development Partnership". www.vedp.org. Retrieved 2019-03-29. ↑ "Virginia loses tech jobs but maintains highest concentration in U.S. - Washington Post". web.archive.org. 2013-01-17. Retrieved 2019-03-29. This page was last changed on 29 March 2019, at 19:01.